"Michael is going to start the year on the disabled list," Francona stated in his media session, as was revealed in Paul Hoynes' article on cleveland.com. "he'll play in today's game. he's doing great. i just think, after we put our heads together, it would be good for him. he's just not quite ready maybe to carry enough of the load. there's no setback or anything like that." when discussing this situation with Michael, Tito said he appreciated Michael's honesty. according to another article by Jordan Bastian on mlb.com/indians, Michael's upcoming minor league games will be treated like normal games, where he doesn't bat in every inning--an option allowed for rehabbing players. "we're going to try to space that out where it mirrors a Major League game, so his times of inactivity are the same as when he's in a Major League game," explained Francona. even with this little bit of extra rehab, Michael's return sounds like it is right around the corner. "he's going to be ready when he's ready. [he's] close enough where we certainly talked about him making the ballclub. but it made sense to let him have some more playing time." fans who have not been keeping up with the Michael updates all offseason and this spring (🙄) are alarmed by this news, but they shouldn't be. Michael's made immense progress since his surgery. when he reported to Arizona, he had already been swinging a bat, which was a huge advantage. the main part of his rehab that he really needed to focus on was running. once in camp, the medical staff brought Michael along slowly, permitting him to do straight-ahead running only at first. he next advanced to decelerating, then began forward and backward running, then progressed to doing lateral movements, aka cutting and turning. he passed every benchmark before proceeding to each new step. Michael saw his first game action in a simulated game on March 7 before he graduated to the last stage of his rehab on March 11--baserunning. after playing in three minor league games on March 14, March 17, and March 19, he finally made his Cactus League debut with the Tribe on March 21. he also played in games on March 23 and today (March 25). Michael went 4-for-10 (.400 BA) and totaled three singles, one home run, two RBI, two runs, and two strikeouts in three big league contests. while he might look ready at the plate with his bat, the concern here is that Michael builds up enough endurance to be able to play complete games in left field for much of the year. if that means he needs to open on the disabled list and miss a week or two so he can be good to go for the whole rest of the season after that, then i don't know why or how anyone would argue with it. if you need a quick refresher of how things got to this point, let me remind you that Michael sprained his right ankle on May 7 last year after stepping on 1st base awkwardly while trying to run out a ground ball, yet did not require anything more than a three-day rest period between May 8-10. he re-injured the ankle again in early June, but played through the soreness. after going on the Paternity List on June 16, the Indians moved him over to the 10-Day DL on June 19 to give him another week off to rest and strengthen his ankle. he was activated on June 26, as planned. all was going well until Michael re-sprained the ankle on August 8. simply running over to center field to back up a play did him in. he left the game and needed some assistance to get down the dugout steps into the clubhouse. he went back on the 10-Day DL on August 9. when the "mild" sprain wouldn't heal, Michael sought second and third and fourth opinions, only to discover the real problem was a deltoid ligament sprain and ankle synovitis. he rejoined the active roster on September 30, just in time to get a couple at bats in the final two regular season games. he was deemed healthy enough to play in the American League Division Series as well, but once the Tribe was eliminated from the postseason, Michael went under the knife on October 18 and was given a four-to-five month recovery timetable. he recently hit that five-month mark on March 18.
his first experience on the disabled list occurred on August 26, 2011. he was placed on the 15-Day DL with right wrist pain, which ended up being a broken hamate bone that required season-ending surgery. following that, despite some bumps and bruises along the way, Michael avoided the DL until his 2016 campaign. that's when he opened the season on the 15-Day DL on April 3, as he continued to recover from offseason right shoulder surgery for his torn right labrum. he was activated on April 25, but suffered a setback and went back on the 15-Day DL on May 14 with what was originally called right shoulder inflammation, then later re-diagnosed as chronic right biceps tendinitis. on July 3, Michael was transferred to the 60-Day DL in a pure paper move. after several attempts to get back on the field, the Indians had to shut him down for good and he underwent season-ending biceps tenodesis surgery on August 15. Michael initially went on the 10-Day DL with a right ankle sprain on June 19. he rejoined the Indians on June 26 and appeared to be back to normal. ultimately, he had to return to the 10-Day DL with a more serious right ankle sprain on August 9. it went from a mild sprain to a deltoid ligament sprain and ankle synovitis. 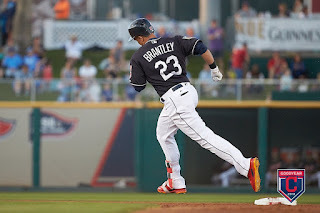 after missing 50 games, he was activated two days before the regular season ended on September 30.
once i finish Brantley's Cactus League Rehab blogs, they will be posted sometime after the conclusion of the Indians' final spring game on March 27. then you can read all of Michael's daily spring progressions in detail. as the Tribe's regular season gets underway and Michael continues to rehab, i will be keeping track of and compiling all the news in a DL updates/minor league rehab numbers blog, to be published immediately upon his activation from the disabled list. be sure you're glued to my twitter @clevelandgirl23 for the latest updates and minor league game info during his DL stint.